Can you please provide the window dimensions? 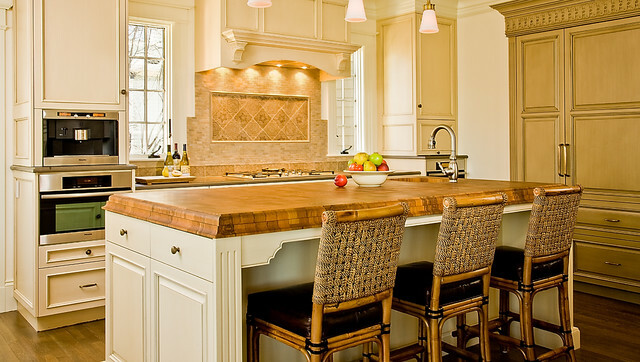 The wood countertop is beautiful...what is it? Thank you Grothouse Lumber - we love this top! Paula - What is the counter product on the island? Is it wood or a leather treated granite? The island top is an end grain burmese teak with a super double roman ogee edge from Grothouse Lumber! We love their wood tops - you should check out their website. Love these pendant lights! Who are they buy? What is the backsplash tile called? We sourced this tile from Tile Showcase, in the Boston Design Center. I suggest you contact them with this Image from This Old House 2007. They will hook you up! The seating was sourced by the interior designer and unfortunately I do not have further information. I wish I could be more helpful.